This salsa is a preview to another recipe that I am showcasing on Monday, cilantro lime chicken tacos. 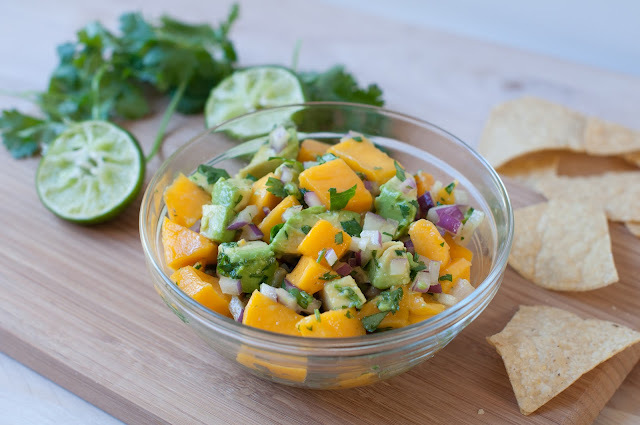 This mango avocado salsa and tacos are rated a 10+ in my house, because they both pair so perfectly together. This salsa is a great stand along recipe though, so I wanted to showcase it as a separate recipe, rather than combine it with another where it might get lost. This salsa is super easy to throw together and all of the ingredients are in season right now and as fresh as can be. I love this salsa because it’s not your standard red or green salsa. It’s a unique combination of flavors and textures. We love serving this salsa alongside some tortilla chips. Bring this to your next summer potluck and I guarantee it will be gone, you might even want to make a double batch. Note: Martha’s recipe included 1/2 to 1 habanero chile, (stem and seeds removed and minced) but I chose not to include that in this salsa because it would then be to spicy for my kids. Feel free to add this to your salsa, if you want it to be spicier. 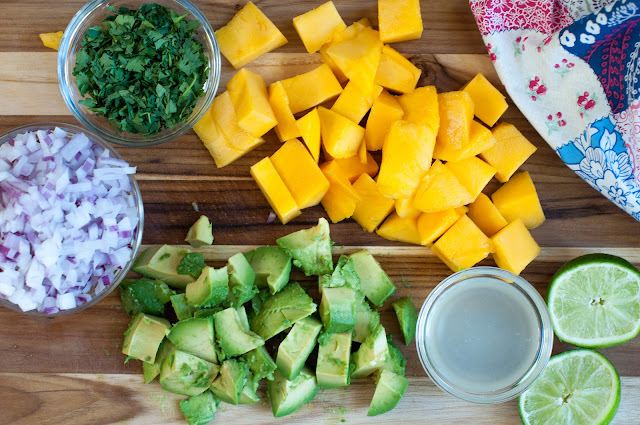 Squeeze the 2 tablespoons of fresh lime juice, dice up your red onion, chop up your cilantro, dice up your avocado and mango. Note: If you are not familiar with how to dice up a mango, I will show you the step-by-step instructions below. Get out a large bowl and combine all the above ingredients, add the tablespoon of olive oil and the 1/2 teaspoon coarse sea salt. Gently combine all the ingredients together. This salsa goes great with grilled chicken, pork, seafood, beef or just to serve on the side with some crunchy tortilla chips. I wanted to show you a photo of a champagne mango. You may notice these mangos in the grocery store and don’t be afraid to give them a try as they taste great. Be sure to get ones that are soft and wrinkly, as shown in the below photo or else they won’t be sweet. 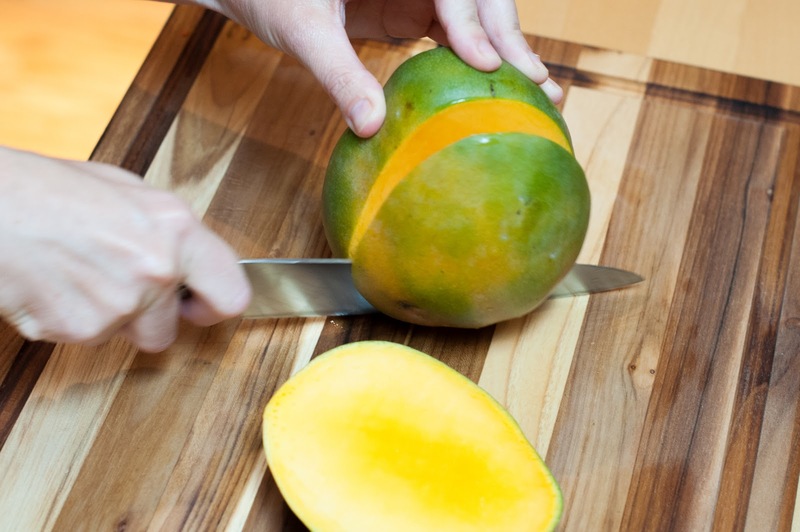 You will cut and dice these mangos the same way as a regular mango. Next, I’m going to show you how to dice up a mango. My friend Cathie stopped by to pick up her daughter as I was making this salsa, so I asked her to demonstrate it for you, as she is an expert at mango slicing and dicing. Thanks Cathie! First off, wash your mango. 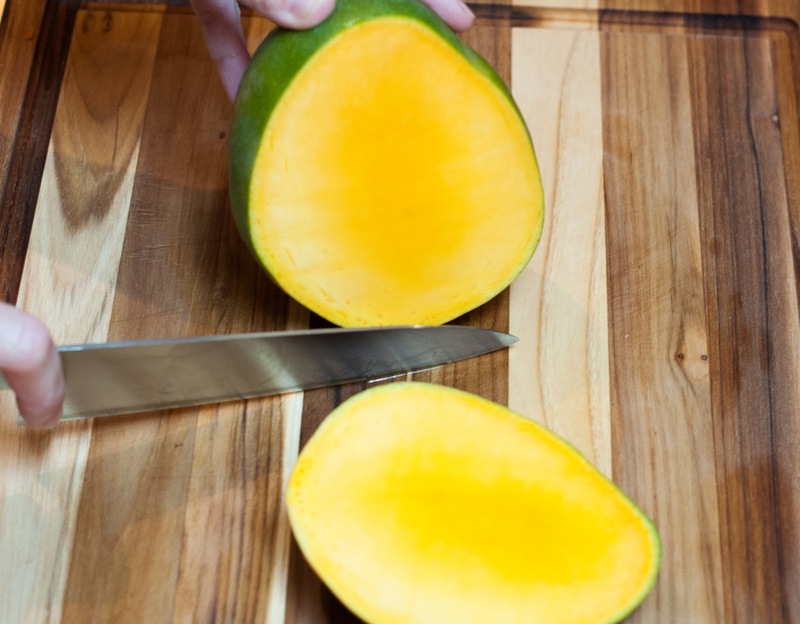 Mangos have a flat, oblong pit in the center of them, so you don’t want to slice down the center of a mango. 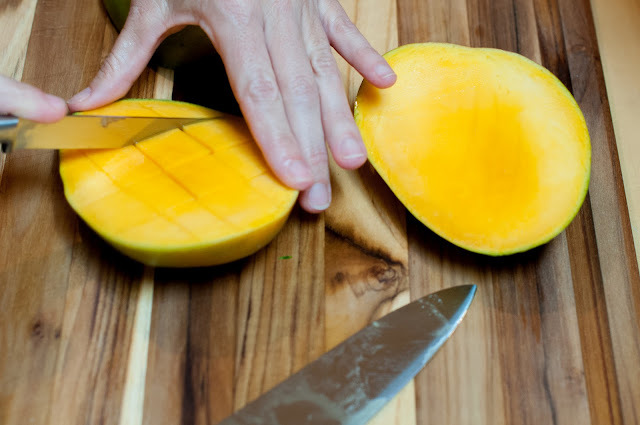 You will want to cut the mango on both sides of the pit, as shown below. Hold the mango with one hand, stand it on its end, stem side down, and cut from the top of the mango, down one side of the pit. Repeat on the other side. Note: If you hit the pit, try to cut a curving arc around it. Also, the flatter sides of the mango are the better sides to cut off. 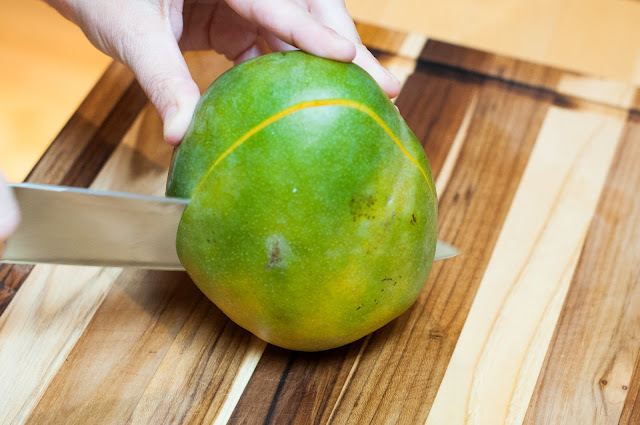 Take a mango half and cut/score vertical lines into the cheek using a small paring knife. Make sure the knife tip goes all the way down to the skin, but not through it as you score the lines. The further apart you score the lines, the thicker your slices will be. Turn the mango and make another set of vertical lines to make a checkerboard pattern. 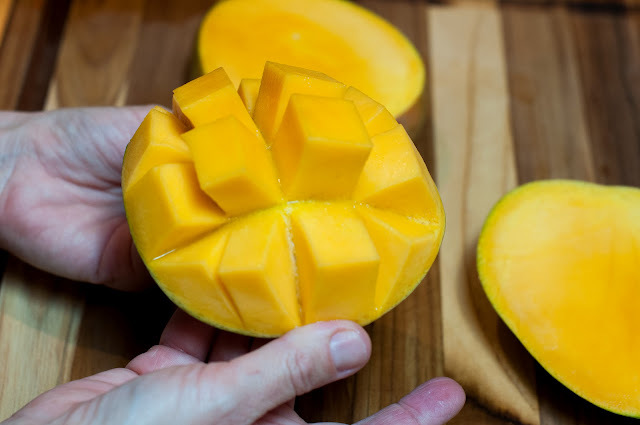 Note: You can make these slices thinner or fatter depending on how big you want your mango chunks. 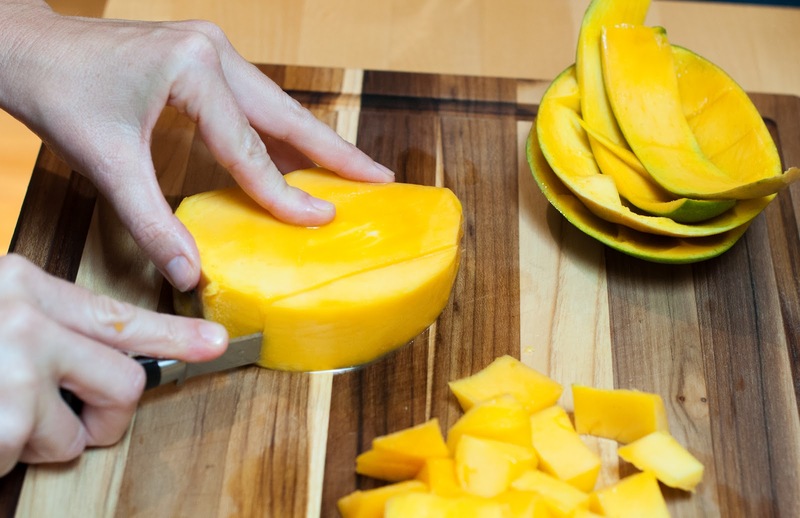 Gently scrape the mango chunks off with a paring knife. 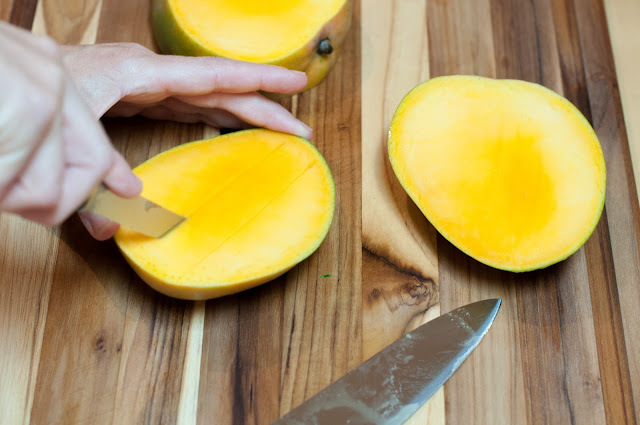 To get the most of your mango, use a paring knife to peel off the outer skin on the remaining piece of mango surrounding the pit. Slice off any remaining mango meat on the pit and then cut those pieces into small chunks. 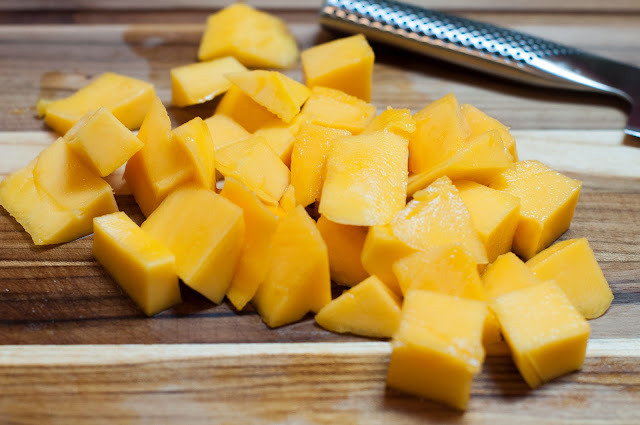 There you have it, some diced mango! Feel free to slice up your mango into smaller pieces if you want. Thank you Cathie for being my hand model today. My blogger buddy Sharon from Likikoi Joy, made up this salsa for a party. I just loved her Instagram photo, so I asked her to send it to me! I think it’s helpful to see other people’s photos of dishes besides mine! Don’t you just love the bowl she used? 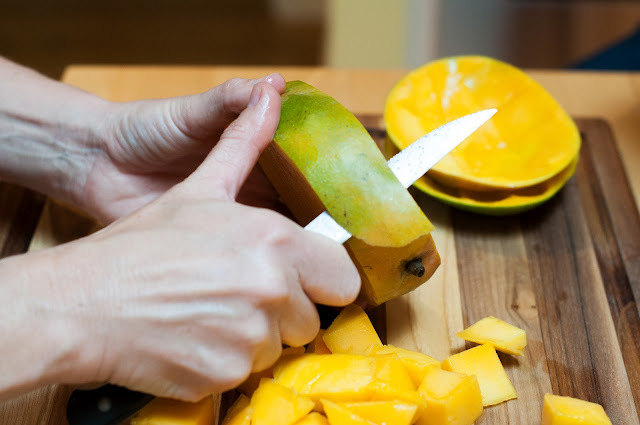 Note: If you are not familiar with how to dice up a mango, check out my post where I show you step-by-step photos. Get out a large bowl and combine all the above ingredients. Add the tablespoon of olive oil and the ½ teaspoon coarse sea salt. I’m so excited that I’ll be making this for the 4th of July party we are going to! My friend Shannon is making carne asada and I think this will be perfect with that. WOOHOO!! I had to come over and print this right now so I can get the ingredients tomorrow. Hey Em! I’m so happy you made this for your mum and that she loved it. Yaay! I’m also glad the mango tutorial helped you (it helped me as well). We just got back in town yesterday and the kids start school this week, so maybe a get together next week? I’m glad things have slowed down for you, as it’s no fun running around like a madwoman! 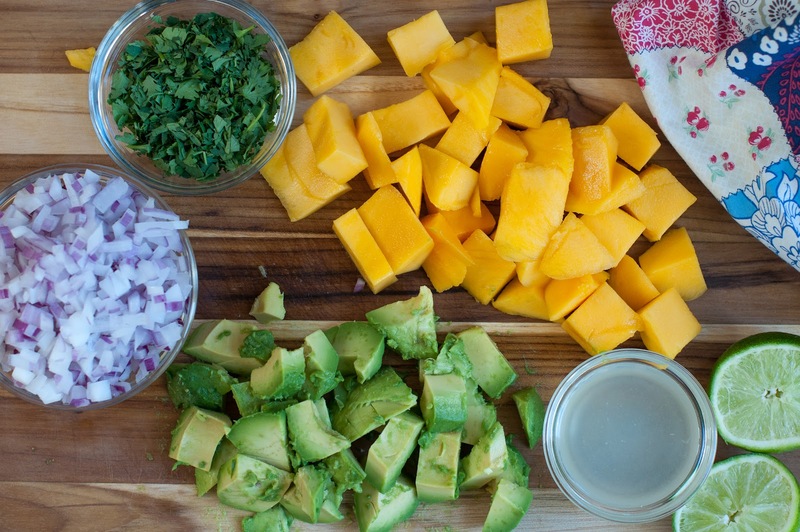 great step-by-step pics – I feel like mangoes are one big pit! No matter where I go on it, I run into the pit. Love fresh mangoes, hate dealing with slicing them! Thanks Averie. I’m finding the more I cut up mangos, the easier it is. I have been cutting one up every day as it’s now the kid’s favorite fruit. Happy Birthday to Aaron… any celebration or surprise party for him? 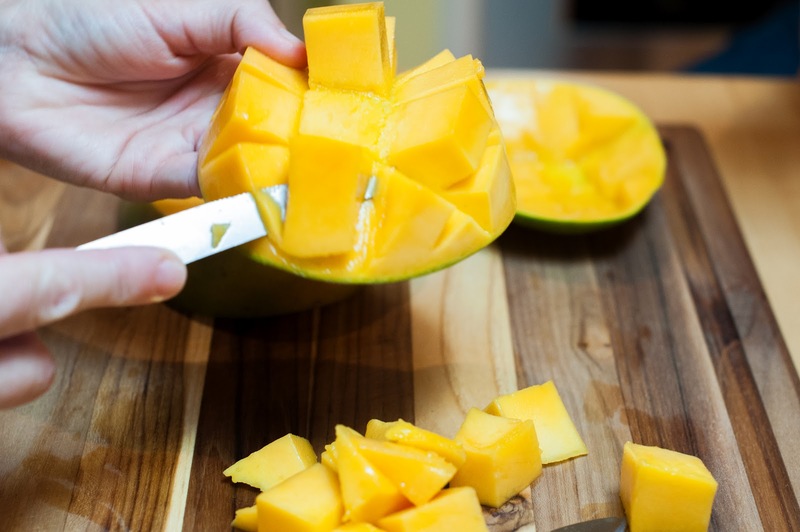 Good, clear photos of the mango operation — makes all the difference in getting usable mango. Thanks Sharon. My friend did a great job pausing in between each step so I could take the photos.